The Nostalgia Electrics 8-bottle wine chiller features an electric, single zone cooling system that does not use refrigeration. The cooling system is controlled by a blue LED display that matches the blue lighting on the interior of the chiller, which can be switched on or off manually. 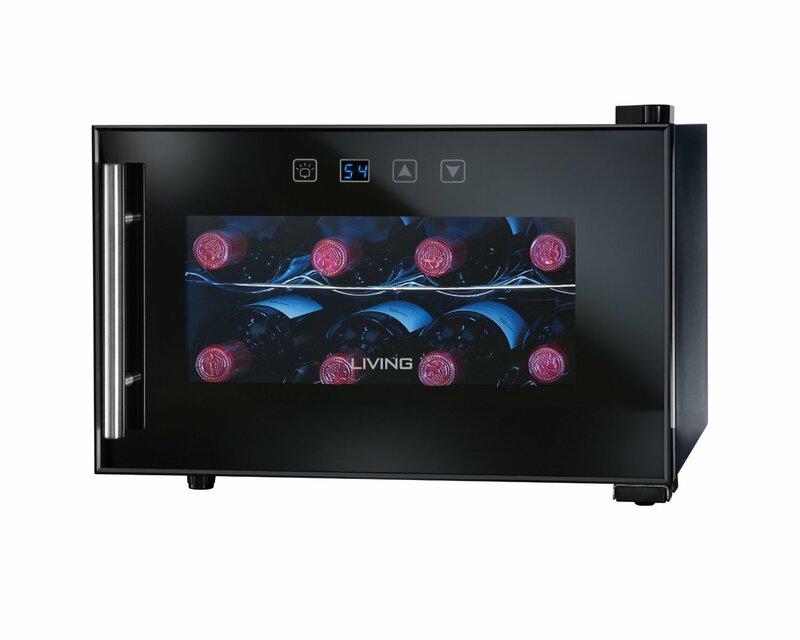 The adjustable thermostat cools with appropriate room temperatures, and comes equipped with an auto defrost function to ensure your wine is always easily viewable without having to open the chiller door. The Nostalgia Electrics wine chiller is free standing and measures 11 x 18.9 x 16.5 inches (27.9 x 48 x 41.9 cm). It takes 120 volts, and weighs 24.4 pounds (around 11 kg). This 8-bottle wine chiller is highly rated and works just as it should, but still has a few kinks as can be expected. Below, I have listed the main pros and cons of this product. First, the positive. The Nostalgia Electrics wine chiller is quick and easy to set up. The temperature can be easily maintained using the LED control panel on the front. Overall operation of the unit is simple enough for anyone. The chiller is very quiet when cooling, making little to no noticeable noise. The cooling system activates just a few times per day, and doesn’t run for long as the design provides sufficient insulation to keep cold air in and warm air out. Its compact size allows you to put it on your countertop or even on a shelf. If you plan to put it on a shelf, make sure to leave enough space behind it, as detailed below in ‘cons’. The wine chiller is eco-friendly as it does not use refrigeration. The unit uses a heat sink with two fans facing opposite directions, one to draw warm air out, and another to inject cooled air into the chiller from a Peltier cooler. The price is relatively low compared to other chillers. The Nostalgia Electrics 8-bottle chiller offers great value. The Nostalgia Electrics wine chiller requires at least four inches of space behind it in order to have enough air flow to run properly. If less than four inches of space is left between the back of the chiller and the wall, it may not function properly. The lack of space for proper ventilation might prevent the chiller from being able to cool to the desired temperature. There should not be anything on top of the chiller either, as this could also affect its ability to regulate temperate. This drawback could pose a problem to those who plan to put the chiller on a shelf, or tuck it right up against the wall to conserve space. It looks rather like a microwave oven. To some, that might make it unappealing when compared to some other more sleek looking wine chillers or wine cellars. Aside from those two drawbacks, the Nostalgia Electrics 8-bottle wine chiller works great, and is a good buy for those looking for a small cooler to store their wine in.